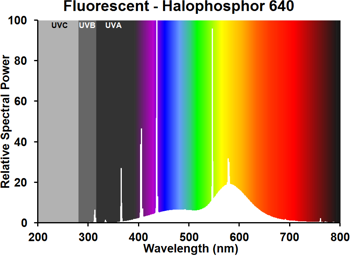 Since the inception of the fluorescent lamp, its linear format has been regarded as an advantage in many applications - but in some cases has been a drawback. The first attempts to develop a more compact lamp can be traced back to General Electric's invention of the Circline model in 1945. That was first offered in the 12" diameter 32W lamp, being joined in 1947 by a smaller 8" diameter 22W version. 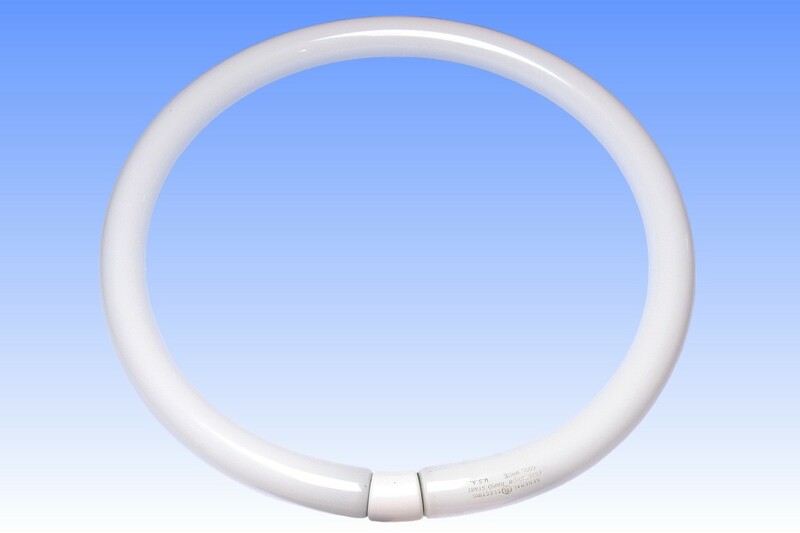 This larger lamp of 16W diameter and 40W rating was introduced by GE in 1952, and is believed to have originated in Europe. 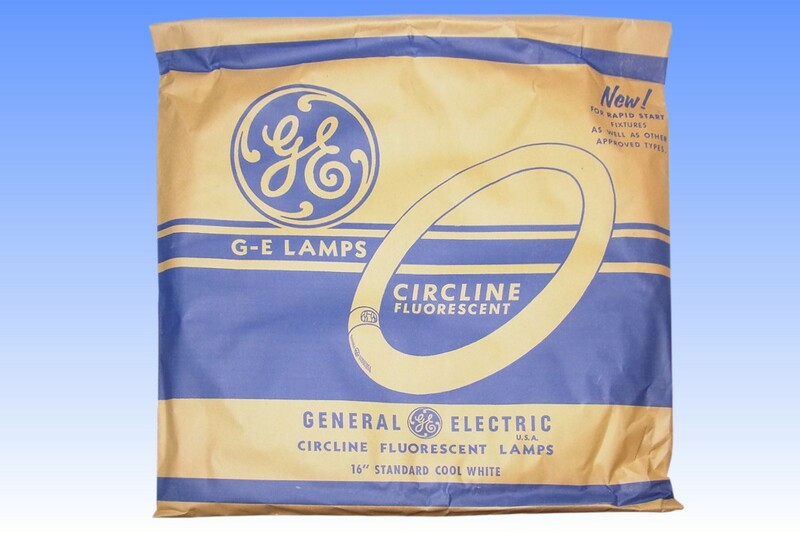 Having been produced in 1956, this particular lamp is therefore one of GE's earliest Circline lamps of this type. 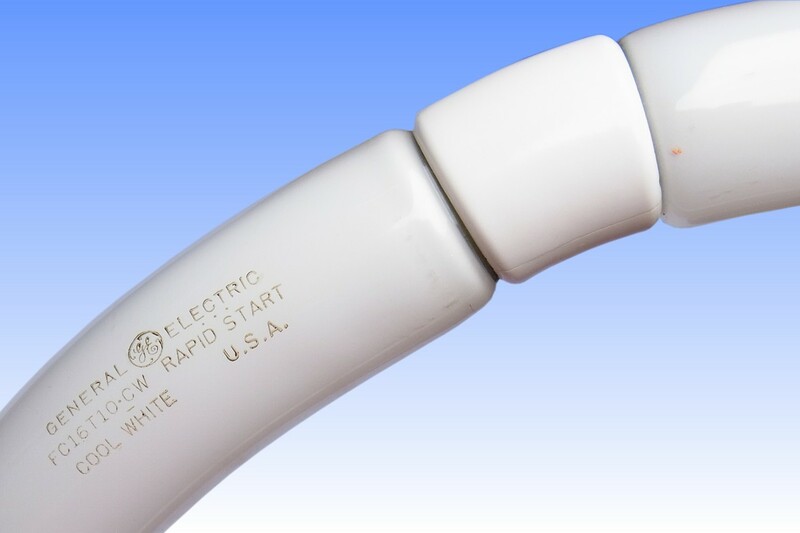 GE's novel process for bending the tube was carried out on the lamp exhausting machine. On the vertical type exhaust machines the tubes are hung vertically by the exhaust tube protruding from one end, and pass though an oven which heats the glass to aid outgassing. 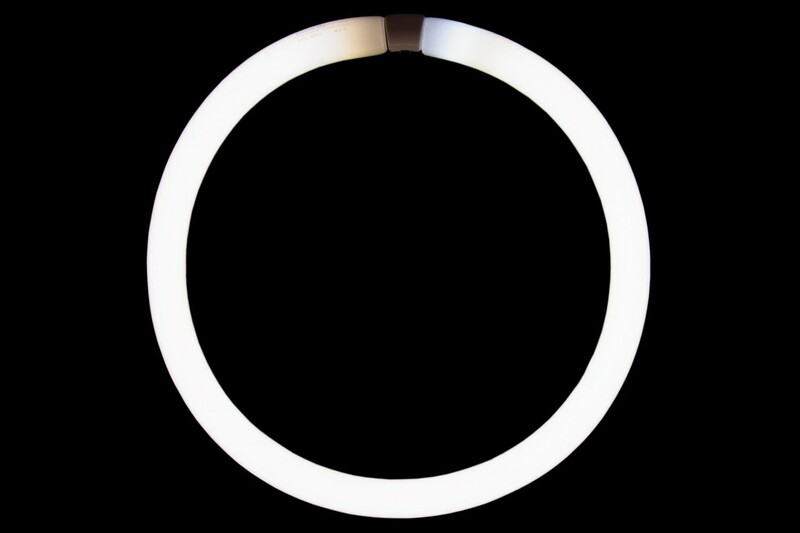 For producing Circline lamps the ovens are operated hotter than normal, so as to soften the glass tube. Just as the glass begins to stretch and fall down under gravity, a pair of rollers pick up the lower end and coil the tube into a ring shape. The tube is then dosed with mercury and argon gas, and sealed off. 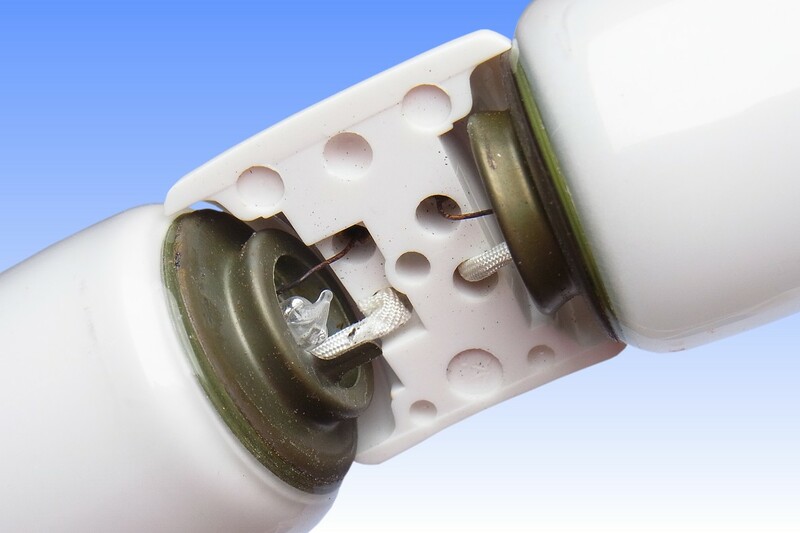 This early lamp is made according to the original process, in which a small metal cup is sealed into each end of the discharge tube - visible in the detail photo in which the cap has been opened. The reason for this is not clear - perhaps it allowed easier manipulation of the glass during the tube-bending process. The cup is presumably made from an iron-nickel alloy, evidenced by the greenish colour of the glass-to-metal seal. In later years this cup was omitted, and the diameter of the glass tubing also changed from T10 to T9.